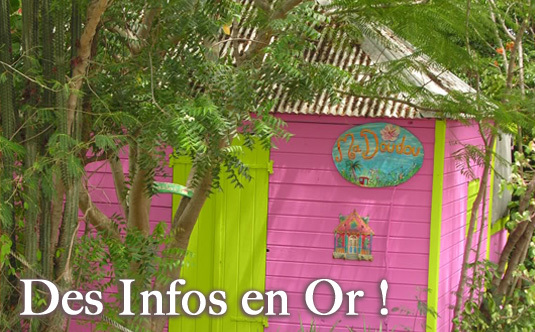 Accueil > Des Infos en Or! 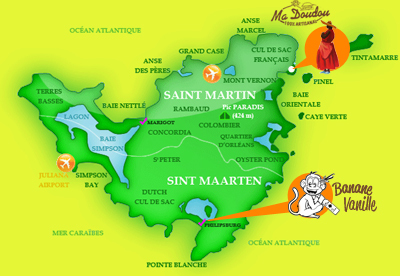 “As you visit the many shops on the island of St. Martin you will notice painted bottles labeled "Rhum ". This is a delicious local product that is made in a little workshop in Cul-du-sac. It is a short drive from Orient Beach. Although it is available in most of the local stores; it is fun to visit the shack. It is not an easy place to find, however, so you may just want to buy it in your choice of grocery, liquor, or airport shops. A one liter bottle of punch (30% rum) was approximately 9 Euros. It is available in almost every conceivable flavor or mixture of flavors. Madame sells them in glass or plastic bottles. The plastic bottles are signficantly lighter than the glass version. You should buy these if you are worried about the weight limit. Although the bottles have screw caps (plastic liter bottles) or corks (all other glass bottles), we sealed them with candle wax. We had noticed, on previous trips, that some of them leaked slightly. Be sure to pack the bottles in your checked luggage ! You can NOT carry it on in your hand luggage. Put the sealed bottles in large zip-loc bags and then wrap it in bubble wrap. Extra care will help insure it arrives home without leakage/breakage !